Founded in 1869 by the Sisters of Charity of the Incarnate Word of Houston and San Antonio, CHRISTUS Santa Rosa Health System (CSRHS) is a Catholic, faith-based, non-profit health and wellness ministry dedicated to extending the healing ministry of Jesus Christ and providing the highest quality medical care and services available. As one of the top health care organizations in South-Central Texas, CSRHS has five hospital campuses, including four adult campuses and one children’s hospital. 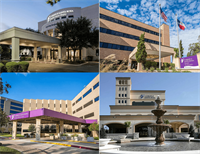 Our adult hospitals include; CHRISTUS Santa Rosa Hospital – Medical Center, CHRISTUS Santa Rosa Hospital – New Braunfels, CHRISTUS Santa Rosa Hospital – Westover Hills and a short stay surgical hospital - CHRISTUS Santa Rosa Hospital – Alamo Heights. Located in the heart of downtown, The Children’s Hospital of San Antonio (CH of SA) is the first freestanding hospital in San Antonio solely dedicated to the care of children. Baylor College of Medicine, one of the top medical schools in the nation, is the academic partner of CH of SA with 170 pediatric subspecialists affiliated with Baylor. CSRHS also owns a majority interest in CHRISTUS Santa Rosa Physicians Ambulatory Surgery Centers (CSRPASC) – San Antonio, LLC, a joint venture physician partnership which is comprised of two outpatient surgery centers in San Antonio with facilities in Stone Oak, Medical Center, New Braunfels, and San Marcos. For more information on CSRHS, visit christussantarosa.org or facebook.com/christussantarosa. For more information on CH of SA, visit chofsa.org or faccebook.com/thechildrenshospsa. Get ''realtime'' appointments with your CHRISTUS doctors!